Front page image shows Jodie’s attacker giving a peace sign…yeah, right. Imagine e.g. Carissa Moore getting attacked at Kewalos (by a bigger middle age man) for confronting him for continual shoulder hopping her. He decides to do THIS to her…read on. It was back on Aug 22nd, 2018 when former Pro Surfer, Jodie (54) thought she might actually be murdered while simply doing what she loved best. In desperation, she feigned drowning by going limp. She faced her alleged assailant in a Ballina Court Room recently as the case continued. The spot she was attacked was at Lennox Heads. According to Cooper, he held her underwater until she was forced to fake drowning in order to escape the attack. It was now learned that her attacker was ‘air mat rider’ Mark Thomson, father of Australian shaper Daniel ‘Tomo’ Thomson. Thomson reportedly ‘burned’ or cut off Cooper on his surf mat, when Jodie call him on it, he took offense and went after her. This sort of non-logic and lame excuse sorta makes sense when you step back and realize this is a man who just threatened and assaulted a woman which may have ended in tragedy. Unfortunately for Thomson, we live in the 21st century and video exists of the incident. So, the courts will decide. His argument won’t likely ‘hold water’ in court. Expect all the hot air to be taken out of his mat, too. On a positive note, he won’t likely be charged for riding a blow-up pool toy…but threatening, fighting, & hurting women is another story. Check out more here The Sydney Morning Herald. Former champion surfer Jodie Cooper, was allegedly held under water during a surf rage attack by surfboard shaper Mark Thomson. She pretended to drown as she feared for her life. 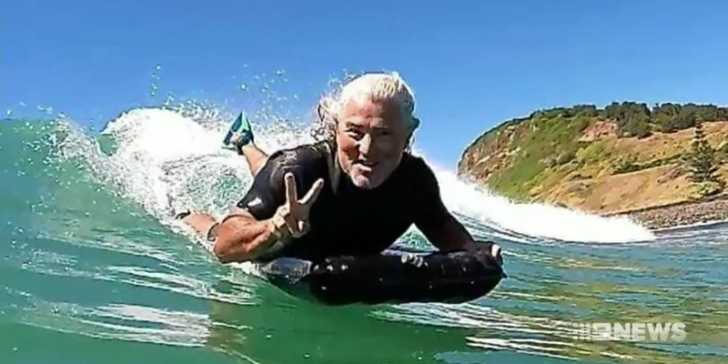 Ms. Cooper, was surfing at Lennox Head on August 22 last year with a crowd of about 100 when she took off on a wave and was cut off by Mr. Thomson riding a surf mat, police say. “He was dropping in on me, nearly on top of me. He was aggressively cutting back into me and felt like trying to provoke me off the wave,” Ms. Cooper, who was a stunt double in the cult 1991 film Point Break, said. Mr. Thomson then allegedly grabbed Ms. Cooper and held her head under the water. “He had reached around and grabbed me and pushed me under the water. He just grabbed me with two hands and just forced me under the water,” she told Ballina Local Court on Friday. She said she was terrified by the 54-year-old, the court heard and decided to pretend she had drowned to stop the alleged attack. “Why don’t I just pretend that I drowned? … When I went limp thinking I was dead or drowned or something, that’s when he released,” she told the court. Mr Thomson is the father of well-known surfboard shaper Damien Thomson and manufactures surf mats on the North Coast. “I said I’ll see you at the cop shop,” Ms Cooper replied, the court heard. Ms Cooper reported the incident two weeks after the alleged attack, prompted by a whiplash-like pain in her hand. “I was fearful, I was in shock, I really just wanted to crawl up into a ball and not deal with it,” she said when asked why she did not report it on the day. Police say they have footage of the incident, and that, when they went to interview Mr Thomson about it, he said it was a “maritime collision”. “Seems like a load of gossip really,” he said in a police body camera video tendered in court on Friday. Mr Thomson has plead not guilty to one count of assault and one count of assault occasioning actual bodily harm. The case has been adjourned until July 18. Wait till you hear what blow-up pool toy’s lawyer had to say near the end of the short clip…they’re the perfect fit.